Ortiz, A. 2015. Family farming: feeding the world. GREAT insights Magazine, Volume 4, Issue 2. February/March 2015. 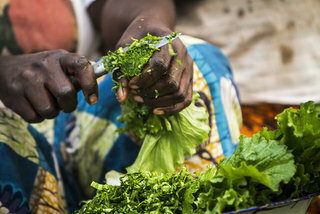 Almost half of the world’s households depend on family farming for their livelihood. The International Year of Family Farming 2014 had great success in increasing the awareness of this key agricultural approach that provides over 70% of world food production. 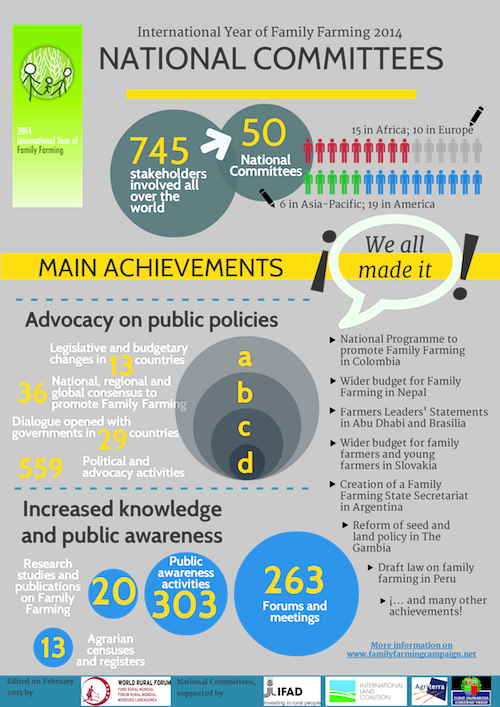 2014 was marked by great progress for family farming all over the world. The International Year of Family Farming (IYFF-2014) brought about a number of breakthroughs in the promotion of family farming, smallholders, artisan fishing, pastoralists and indigenous communities. 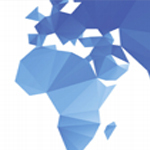 Worldwide, more than 700 institutions and organisations were involved in the IYFF-2014, including farmers’ organisations and rural development organisations, non-governmental organisations (NGOs), consumers’ associations, research institutions, governments and international organisations. The key role played by women farmers and family farmers in the sustainable supply of food was widely recognised throughout the year. The National Committees were major stakeholders during the IYFF-2014. These platforms, most of them led by civil society organisations, were promoted by the World Rural Forum (WRF) – supported and recognised by the International Fund for Agricultural Development (IFAD), Agriterra and the Food and Agriculture Organization of the United Nations (FAO) – as genuine and pluralistic spaces for dialogue and negotiation on national public policies related to family farming. 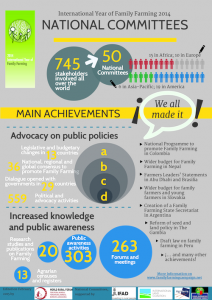 The activities developed by these committees led to 12 legal and budgetary changes benefiting family farming. More positive changes are expected in the coming months, since 30 similar processes were started during the IYFF-2014. Despite differing characterisations from country to country, family farming is commonly portrayed as agricultural, forestry, fisheries, pastoral and aquaculture production that is managed and operated by a family and predominantly reliant on family labour, including that of both women and men. According to this definition, the family and the farm are linked, co-evolve and combine economic, environmental, reproductive, social and cultural functions. Apart from its exact definition, what no one argues about is family farming’s key role in food security, poverty alleviation and biodiversity protection. 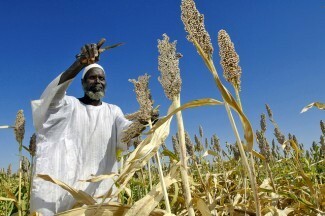 Over 70% of world food production is provided by family farmers, making family farming crucial to fighting hunger and malnutrition, while around 40% of households globally depend on family farming for their livelihood, which makes family farming important in contributing to stabilising the population in rural areas, preserving historical and cultural values and generating income and consumption. Small farms have also been shown to be more productive and sustainable per unit of land and energy consumed; the bond between family farmers and their environment makes them a guarantee of sustainable management of natural resources. Moreover, besides being a source of genetic agro-diversity, family farming can ensure the preservation of native seed varieties and native livestock breeds well adapted to various environments. Despite its importance, the role and potential of family farming as a means to ensure food security is not sufficiently recognised and is neglected in many countries. With the purpose of changing this, an intense campaign coordinated by the WRF and backed by more than 360 organisations was launched in 2009 to promote the declaration of an International Year of Family Farming. This common goal was supported by the government of the Philippines, which presented a draft resolution – co-sponsored by 40 countries – for the declaration of the IYFF-2014 before the United Nations. The UN General Assembly unanimously approved this declaration in December 2011.Civil society organisations continued working and trying to add new drivers in favour of family farming; likewise many governments and international agencies joined the preparations for the IYFF-2014, in dialogue with rural organisations. Fruitful dialogue between civil society, governments and international agencies was generated across the world in order to push the main goal of this International Year: to attain public policies that support the activities of family farmers. At the same time, the FAO implemented the official programme of the IYFF-2014 in collaboration with governments, international development organisations and farmers’ organisations. Another UN agency, the International Fund for Agricultural Development, also became a key stakeholder during IYFF-2014, promoting the design and implementation of policies and programmes focused on family farming. The creation of IYFF-2014 National Committees was promoted by the WRF with the support and participation of other stakeholders from the rural and social sectors, as well as public institutions and international organisations. These National Committees incorporated as many farmers’ organisations and other civil society representatives as possible, since civil society represents one of the three pillars required for the creation of an official national committee (national governments and international organisations represent the other two). By the end of IYFF-2014, there were over 700 different entities (NGOs, farmers’ organisations, national ministries, international organisations and research centres) participating in 50 National Committees, spread across five continents. Despite their varying composition, size and level of progress in terms of implementing initiatives, all these National Committees have defended the same overarching vision: to enable their nations’ family farmers to feed their inhabitants. Overall the results of the activities developed by the IYFF-2014 National Committees can be described as extremely positive. Intense consultation, reflection and negotiation within the National Committees resulted in the definition of national goals for the IYFF-2014, the establishment of working plans and the implementation of specific activities. To begin with, declarations and roadmaps restating proposals to improve national public policies emerging from exchanges between civil society actors were drawn up and presented to the competent authorities by, among others, the National Committees of Mexico, the Philippines, Ivory Coast, the United States of America, Paraguay and Costa Rica. Other highly pertinent position papers such as manifestos or concept notes were issued by the National Committees of Burundi, Senegal, Indonesia and Zimbabwe. In parallel to the adoption of these various national, regional and international declarations in support of family farming, new and very specific draft laws emerged within the framework of the IYFF-2014. This is the case in Paraguay with its Decree 1056 including the Presidential Law on public procurement of food products from family farmers. Similarly, in Colombia, a Family Farming Programme was launched by Ministerial Resolution 267, officially establishing the concept of family farming along with a technical committee for the sector. 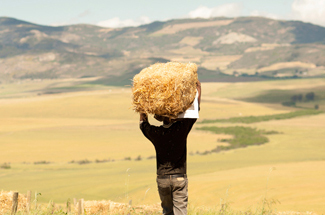 In Argentina, the government issued Decree 1030/2014 providing for the establishment of a state secretariat for family farming. In Burkina Faso, the Ministry of Agriculture promised a budget allocation to strengthen family farming during the growing season while the government of Nepal allocated subsidies totalling €78,000 for the promotion of family farming in 2014. All these examples of activities are only a glimpse into the impressive dynamism underlying IYFF-2014 National Committees. As mentioned above, concrete political improvements emerged during 2014 foreshadowing a much more optimistic future for family farming in various countries. Due to this energy, the global image of family farming is also being upgraded everywhere and is attracting attention from governments and the public. Much more remains to be done in order to recognise the true value of family farming as a means to promote food security and sustainable agriculture. In particular, significant political advocacy is still needed to permanently move away from certain paradigms that work against family farmers. On 14 and 15 November 2014, as IYFF-2014 was drawing to a close, farmer leaders from the five continents, along with rural associations, research centres, National Committees and other stakeholders, gathered in Brasilia to analyse the achievements of IYFF-2014, and to agree to give continuity to the work done thus far. Based mainly on the Manifesto of Brasilia, the global campaign in favour of family farming, peasants, artisan fishing, pastoralists and indigenous people will be extended for ten more years. The main objective of IYFF+10 will be to continue to push for public policies in favour of family farming. Moreover, this process will focus on three key areas: (i) The promotion of National Committees: These Committees showed their strength throughout 2014, promoting improved public policies in different countries. The IYFF+10 renews commitment towards policy dialogue between farmers’ organisations, rural associations, international institutions, governments, research centres and other stakeholders. (ii) Global guidelines for family farming: A widespread participation process will be established in order to develop global guidelines, with the aim of achieving agreement of the international community. 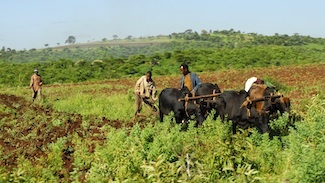 As in the cases of the Universal Declaration of Human Rights (UDHR) or the Voluntary Guidelines on the Responsible Governance of Tenure of Land, Fisheries and Forests, achieving global guidelines in family farming would mean creating a common goal, a shared and universal proposal for the promotion of family farming. The process to develop global guidelines will take into consideration the previously achieved agreements and will address the gaps in these. In this way, the global guidelines will promote family farming in a comprehensive manner. (iii) Promotion of participatory research: Due to the important role of research, the IYFF+10 will promote the active participation of farmers’ organisations and civil society in research processes. Furthermore, the IYFF+10 will also seek to ensure that the Sustainable Development Goals suitably reflect the role of family farming and will promote linkages to the International Year of Soils 2015 and the World Forum on Access to Land in 2016. As with IYFF-2014, IYFF+10 will always seek the maximum cooperation and spirit of understanding between farmers’ organisations, rural associations, research centres, governments and international institutions. This is precisely one of the main lessons learned in 2014: global inclusive campaigns and shared frameworks involving civil society organisations, international organisations, research institutions and governments can provoke positive changes in public policies. For more information on IYFF-2014 and IYFF+10, visit www.familyfarmingcampaign.net. 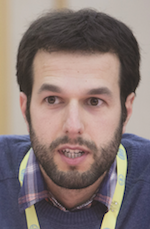 Auxtin Ortiz is Director General of the World Rural Forum. Previously he worked at the Institute for an Agrarian Alternative.